open area with half the space designated as the kitchen the other half containing a table to eat at and a small pantry. the living room there were three doors, each leading to a small bedroom giving the student's their own personal space. Her face back to its proper color Emma went about her normal morning routine. Her attire consisting of a brown flowing knee length skirt, a pair of comfortable flats, and a matching top adorned with a simple design that trailed along the neckline. Coupled with her signature pigtails Emma headed out with a half hour to spare before class. Having a bit of trouble holding her text books in one arm, along with the toasted bagel she brought along -to make up for the one she’d stolen from Kyren- Emma’s gaze fell on dorm B01 her attention immediately catching the names Kyren Stills and Ah-Gyul Shin which were clearly posted on the door for the convenience of the floor supervisors. Approaching the dorm she lifted her free arm knocking loud enough for him to hear just in case he was still in his bedroom. Kyren hadn't been asleep when he heard a knock coming from the dorm door. Instead, he was sitting Indian style on his bed, arms wrapped loosely around Riza, his stuffed teddy bear. The sound of people moving things had distracted him from getting the massive amount of sleep he had gotten used to, but he hadn't had the energy to go see what the commotion was all about. It was probably stuff for his roommate. He didn't hear anything now, so he assumed that they had finished their business, and it was safe to check the door. Getting up a little slow, he trudged to the door, unlocked it, and opened it, not really sure who he would see on the other side. He was pleasantly surprised to see that it was Emma. However, when he took in how she was dressed, he groaned. He had all but forgotten that classes started today, and he most certainly wasn't dressed for the occasion. His hair was still a mess, and he had on navy blue sleep pants with a big white t-shirt that had obviously seen better days. “Good Morning Sunshine.” Emma teased, finding her brother’s wardrobe for class rather amusing. “Guess it’s a good thing I showed up to bring you breakfast! You can’t honestly be planning on going to class like that…are you?” She asked handing him the bagel while adjusting her text books so that they didn’t tumble out of her arms. Tilting her head slightly to the right in order to see around her brother at the clock on the wall Emma sighed… twenty-five minutes until they were expected to be in class With her help Kyren would be ready in no time, that is if he allowed her to give a helping hand. Seeing as the last time she insisted on applying his eyeliner for him at the age of 14 -never using one before that time- her brother came out looking like he had a black eye. Kyren smiled weakly at Emma's greeting, but then struggled to keep a face that was not a pout at her tone when she asked if he was wearing his current outfit to class. Did she really have such little faith in his fashion sense? A better question was, was he seriously worried about his fashion sense being questioned? Deciding it didn't really matter, he took the bagel and stuffed one end into his mouth, letting it hang. He mumbled a thank you, before moving out of the way to let her in. Plucking the bagel from his teeth, he asked, "Well, since I am not up to par with your level of fashion, why don't you pick out my outfit?" He was genuinely curious about what she would have prepared for him. 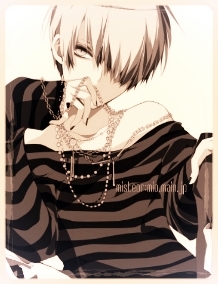 Amused, but choosing not to comment, Kyren took the clothes and went into the bathroom to change and brush his teeth. He was feeling unimaginative with his hair for the day, so he simply picked up the brush and comb and went back into the bedroom, holding them both out to Emma with his best pouty face (which was probably very bad). It would shorten the time it took to get ready since he could put on his eyeliner while Emma did his hair. There was no way in hell that he was going to let Emma do that again. He had learned the first time. A soft smile tugged at the corner of Emma’s lips, seeing Kyren exit the bathroom approaching her brush in hand. Setting Riza aside gently on the pillow Emma scooted back sitting up on her knees in order to properly style her brother’s hair. Making quick time of her work, Emma got off the bed shuffling around the room as she gathered Kyren’s school supplies starting to worry that they wouldn’t make it to class in time…the minutes quickly dwindling away. Once Kyren had finished painting the last of the black makeup skillfully on his face, Emma grabbed his hand tugging him along behind her. There was no way would allow herself to show up late the first day of class. Ah-Gyul had waited until his roommate and his...guest left the room, before getting up to shower quickly and dress. He'd selected his clothes prior so as not to worry about a rush today--his only regret was an inability to get a full breakfast. Ah-Gyul slipped on a pair of sharp black jeans with a chain belt, a blue-and-white striped long-sleeved shirt, and clean black shoes. He strapped on a shiny black watch, grabbed his school things, and headed straight for the classroom, hair smooth and half-dried. Sighing happily at the freedom of being alone once more, Kyren looked around his dorm to make sure he was in fact completely alone. Getting no hint of another presence when he listened, he just went into his own bedroom, not bothering to close the door all the way. It was about time he met his roommate anyway, if only to set ground rules. All but jumping onto the bed, Kyren leaned over the side of it to retrieve the notebook he used to write lyrics. Opening it up, he stared at the unfinished song he had started on yesterday at the library for a few minutes, working up the creativity to try and finish it. His mind seemed to have a different idea, the chorus to a song he wouldn't normally write filling his head until he had to skip a couple of pages and write it down. Before long, he was almost halfway done with the song, the melody coming to him smoothly, even though he knew that by the time he was done, he would never remember it again. Ah-Gyul had returned to his dorm silently, not paying attention to see if his roommate was there. He opened a laptop and seated himself at his computer, comparing numbers and sorting the information from the files into spreadsheets. He worked until late, forgetting to eat dinner. Once his work was finished and sent out, Ah-Gyul stripped off his shirt and jumped in for a thorough, warm shower. He slept dreamlessly. The next morning, Ah-Gyul rose with the birds. He dressed quickly and simply, a black print v-neck, slim dark blue jeans and a belt, and black running shoes. A simple gold chain and Rolex were his only accessories. By the time he was all done, it was five-thirty in the morning. Ah-Gyul laid his things by the dining table in the front room. For a while he stood there, leafing through and filling in his day planner. Kyren slammed the door as he entered, remembering a second too late that he had a roommate, before deciding that right now, he didn't care; couldn't, really. Sighing loudly, he walked into his bedroom and flopped onto the bed, right onto his notebook. It was still on the page he had been writing on last night; he had fallen asleep just as he finished it. A bit of drool had ended up in the bottom right corner, but it made no difference. He had the sudden urge to rip the song apart, but sat there and stared, contemplating if it was really such a good idea. Kyren was just in the process of lifting the page he had just torn out of his notebook, when he heard the knock on his door. His eyes widened a little in surprise, but then he cursed internally as he realized that he must've forgotten to lock the door behind him. Guess it wasn't meant to be, he thought as he eyed the piece of paper, before shoving it into his notebook and closing it. Sighing softly this time, he patted the area of the bed that was next to them, but the words following were not as open as his gesture. "No Emma, I don't believe I am okay." The tone in Kyren’s voice was not something Emma was used to. Sure she had heard him upset, but normally he was soft spoken with her…unless of course she was the source of his anger. That’s how she knew that this had something to with her…in some way or another. Making her way across the room Emma slipped her shoes off crawling onto the bed next to him. Picking up Riza Emma snuggled her close to her chest, waiting for Kyren to tell her what was on his mind. Waiting for Emma to get comfortable, Kyren managed a weak smile at the sight of her hugging Riza. He had a feeling the small comfort the bear could offer would come in handy very soon. Sad eyes left Riza's form to return to the innocent eyes before them; both sets would probably shed tears by the end of the conversation. Steeling himself for what was to come, Kyren sat up straight, and asked Emma, "Before I say anything else, is there anything you would like to tell me?" He hoped she would answer him directly, because right now, if he got anything less, the tears may start even earlier than planned. Emma nervously lifted her head giving Riza a comforting squeeze before capturing her brother’s disheartened gaze. What sort of answer did he expect to get with that question? Of course there were a lot of things Emma had hoped to talk to Kyren about as soon as they had a moment to themselves, but not here not when he was like this… She could see it in his eyes it was obvious that right now Kyren was deeply hurt. Had she done something so bad that would put her brother in this emotional state? The thought itself caused Emma’s chest to tighten making it a chore to breathe. Although he had yet to say anything to that would prompt tears, Emma could already feel them threatening to appear. Kyren's guard was raised even more as soon as Emma removed Riza from her person. It was undeniable now; he would hate this conversation, and hate the world, and perhaps himself, even more when it was all said and done. How had things gotten so bad so fast? He could feel it; the change in Emma that glared back at him, taunting him, telling him that he was being pushed away. He didn't want to believe it, didn't even want to acknowledge that he had the thought, but Kyren knew that the countdown had started. Sure, Emma might think he's wrong, tell him that nothing would change their status as one of the most tight knit families in existence, but the only thing he could envision was Emma's form turning and leaving him where he stood, alone, without a single glance back. Emma's words made things no better. He brought his hands up to hug her in return, but halfway up, they fell, useless at his sides as he slumped forward a little. A single tear had betrayed him, but it didn't matter, because his voiced cracked a little anyway as the words left him, "I take it back. I don't want to know." He didn't even know if he meant them, but he couldn't take them back now. He would have to wait for her response. How did her wonderful day take such a depressing turn? Kyren's comment caused Emma to hold back on what she was going to tell him. Seeing her brother this way was breaking her heart..he couldn’t even properly hug her. That never happened. Whatever was running ramped in his mind was eating him from the inside out. She couldn’t stand this any longer; she had to do something –anything thing to see him happy again. “Kyren, what’s wrong? Please tell me.” Releasing him she pulled away slightly her eyes fixated on his face noticing the tear single tear that had escaped. Sitting back she dropped her gaze down to her hands in her lap. This wasn’t turning out well…where had this crack in their tight sibling relationship come from? Kyren winced. It must be really bad if Emma had changed the subject. He knew that he had said that he'd rather remain as unaware as possible, but if she did actually withhold the information that was clawing at him, wanting him to look in its direction against his will, and feeding him copious amounts of doubt and guilt, he might physically be sick. Hunching in on himself, Kyren breathed slowly for a minute. What could he say to her to make her understand? Nothing, he realized. He was simply going to wither and die at the same speed at which he will be forgotten. The only thing he ever needed to live would be gone, and as much as he wanted to take this up with what he hated, what he feared, whatever it was, he wasn't sure he had the fight in him. "Its.. it's going to take you. Whatever this is... If you follow it, I can't promise to be there unless you fall... and I don't want to see that." No sooner had the words left his mouth did Kyren have to get off the bed and dash to the bathroom. He hadn't eaten much that day, but now there would be nothing. Better get used to the feeling, was Kyren's thought as he kneeled, arms braced against the toilet bowl. As Kyren bounded off the bed towards the bathroom Emma cringed knowing that the stress of what was happening had indeed made him physically sick. Putting her head in her hands she took a deep breath, trying to regain her shaken composure. If not knowing was eating away at him this badly, knowing would surely destroy him. Getting to her feet she followed her brother into the bathroom, her heart aching at the sight of him hunched over on the floor utterly defeated. Sitting beside him on the cold tile floor Emma placed comforting hand on his back to let him know she was there. Whether he wanted her there or not…she wasn’t leaving her brother like this - even if she had to stay all night. Leaning back against the tub she didn’t take her hand from his back. ‘Ky…” She soothingly called out to him - the nickname she called him since they were little. She knew what he meant by “it” in his last statement…but she was determined that he knew this wouldn’t change her. She wouldn’t leave him. “Since dad died, I have always considered you most the important and irreplaceable person in my life, and that’s not going to change ever. I promise you.” She laid her head back on the edge of the tub taking a deep breath. It was now or never…. “We said we wouldn’t hold back, because we were scared that we would end up like….dad. I don’t want to hold back Kyren, so I didn’t. Chuck asked me out on a date, and I said yes.” Lifting her head she looked at her brother hoping he wasn’t going to be sick again. She wanted him to know that she really did like Chuck, despite what others thought about him and the Wilder reputation, Emma didn't care. She saw through all the negative rumors to who he really was...this wasn't some silly high school girl's crush. She liked Chuck, and being with him made her happy. Isn't that what her brother had always wanted for her...happiness? This couldn't be happening, Kyren thought. He was supposed to be the strong one, the one to comfort, yet here he was, pathetically clinging to the toilet bowl, and listening to Emma's words. There they were, just as he predicted, just as he needed them to not crumble into a thousand little pieces, but they were accompanied by more words, far less pleasant ones. His head pounded when she finally told him what was wrong, when he realized that he was more right than Emma would ever know. He was being replaced. Slowly, but surely, Kyren wouldn't be the most important person anymore. How long would it take? How long could he carry the weight of this knowledge, before it crushed him? He wanted to believe in her, have faith that her words were true, but hope was the sharpest double-edged sword. Feeling that he should be done throwing up for now, Kyren lifted his head, but did not look at Emma just yet. He picked himself up from the floor, noticing her hand drop from his back more sharply than he had ever before, and went to the sink to brush his teeth, silence thick between them as Kyren regarded Emma's last words. She had said yes. He wanted to be angry beyond belief that the mangy wolf had gotten his way, but he knew without a doubt, if it was any other guy, the response would be the same. The toothbrush could only clean so much of the taste out of his mouth, so he gave up. He wondered if he should do the same to what was happening now. Would giving up make everything go away? It could, the little voice in the back of his head whispered, but he shook his head to banish the thought. There was no way he could be that selfish, that was one thing he knew. Emma would probably feel more betrayed than Kyren felt at the moment, and that was saying more than enough. But what could he tell her? To leave and never come back? That he never wanted to see her again? It would all be lies, brutal ones that would drive him insane. So he just stood there, defeated for all intents and purposes, and cried, the selfish child that couldn't play nice. Silence…complete silence fell between the two siblings. Dragging on for what seemed like hours to Emma- Why wouldn’t he speak to her? Did he hate her now or was he just trying to find the right words? A bad feeling overwhelmed Emma, her chest tightened hoping that her brother would say something….anything. Even if he turned around yelling the most vicious things he could think of...at least he would be speaking to her. Thankfully Kyren wasn’t getting sick any longer, Emma’s eyes following him as he retreated to brush his teeth. The silence was nerve-raking, driving the small brunette insane. What happened next was worse than any amount of silence she would ever have to endure. Her brother’s shoulders started to shake and she knew he started to cry. Her ever strong brother…who had been there through everything: her rock....she had brought him to tears. Kyren's head snapped up at Emma's next words, headache at full force now, but he payed it little mind as he shook his head violently, small drops from his tears falling onto his clothes. "No," he exclaimed, a little too loud in the small bathroom they were in. He winced at how pathetic he sounded, but it fit; he was pathetic. "Don't you under...stand, Emma," he asked. "T...that's the very last th...thing I want right now." Hopefully she would understand; Kyren could feel the gravity of the situation. This wasn't going to go away anytime soon. He would be forced to actually watch his sister walk away from him, because he wasn't able to force himself to look away, no matter how much he might want to. Too many loose ends... "Aigoo," he sighed. Leaving his books and bag inside his rooms door, he soon noticed the door to the dorm's bathroom wide open. The room was occupied by his roommate and the girl from before. The boy, Kyren, was shaking silently--crying? And the girl....Emma. He caught her question if she should leave--she sounded as miserable as the boy looked. Kyren soon responded--he was crying. Ah-Gyul rapped on the door frame, probably startling the two. Still, Ah-Gyul was in no state of mind to care about that, this was something he needed out of the way. "Sorry for walking in on the drama," he said, with an eyebrow raised. "I wanted to introduce myself to the person I'd be living with."